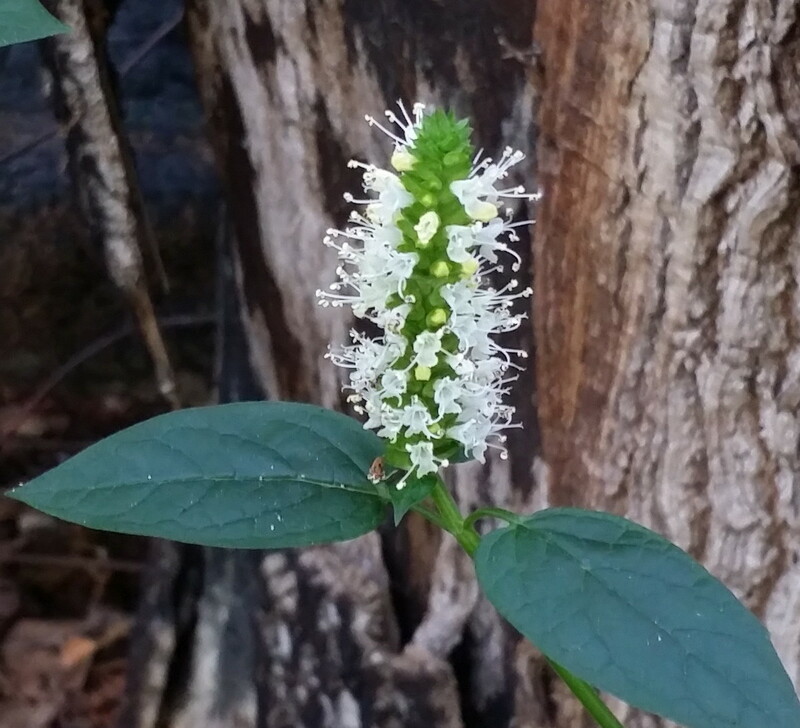 Yellow Giant Hyssop (Agastache nepetoides) is a rare plant in North Carolina, found almost entirely in the Central Piedmont and confined to only a few counties. North Carolina is on the perimeter of its natural range, which is primarily the Midwest and Mid Atlantic. It is rated by the N.C. Natural Heritage Program as status: Significantly Rare-Peripheral, and rank: Critically Imperiled. 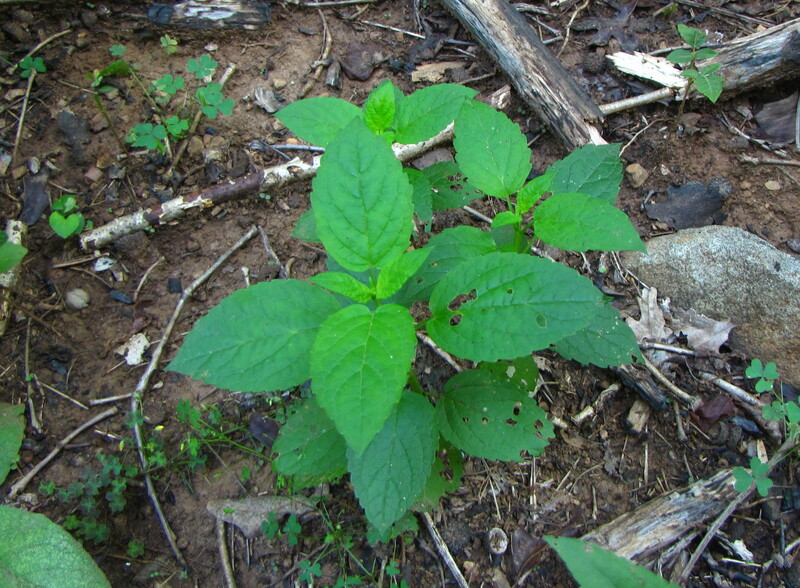 It is a tall (up to 7 feet), rangy native perennial, and a member of the mint family, the Lamiaceae. The population discussed below is located in a wooded area over mafic rock, with light shade and a small period of full sun. As seen below, the mature plants tend to mass closely together to form a loose thicket. 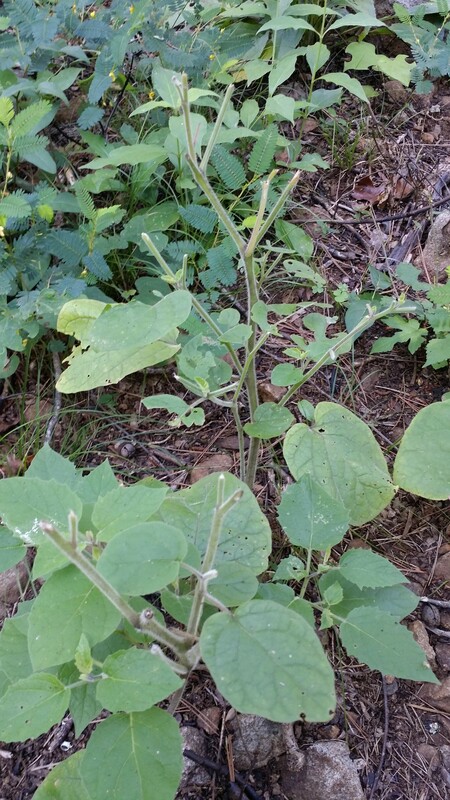 The stems are square with a small, winged ridge running up each corner. They are strong, wind resistant, and tend to persist over the winter after all the foliage is gone. The leaves of mature plants are opposite, coarsely serrated, deeply textured, and are usually broadly lanceolate (shaped like an arrowhead). 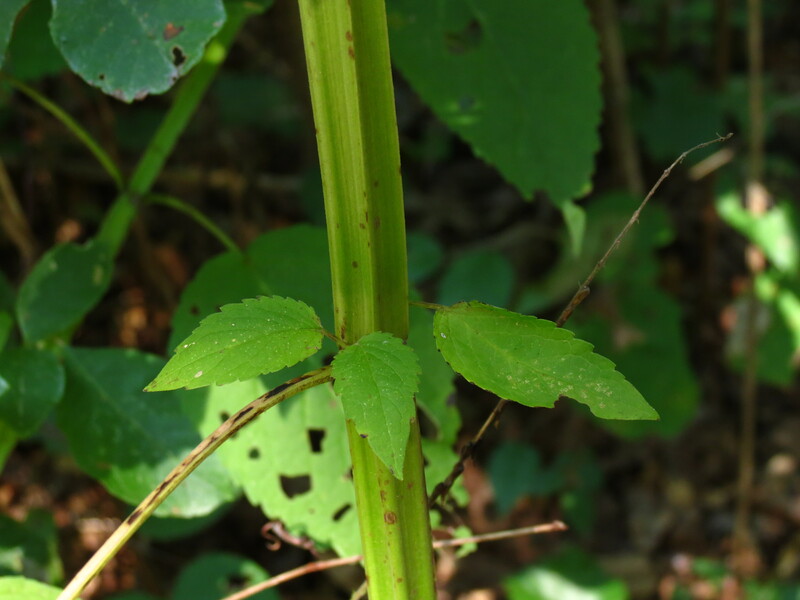 Below is a group of smaller plants separated from the main thicket, allowing a little better look at the plant form. 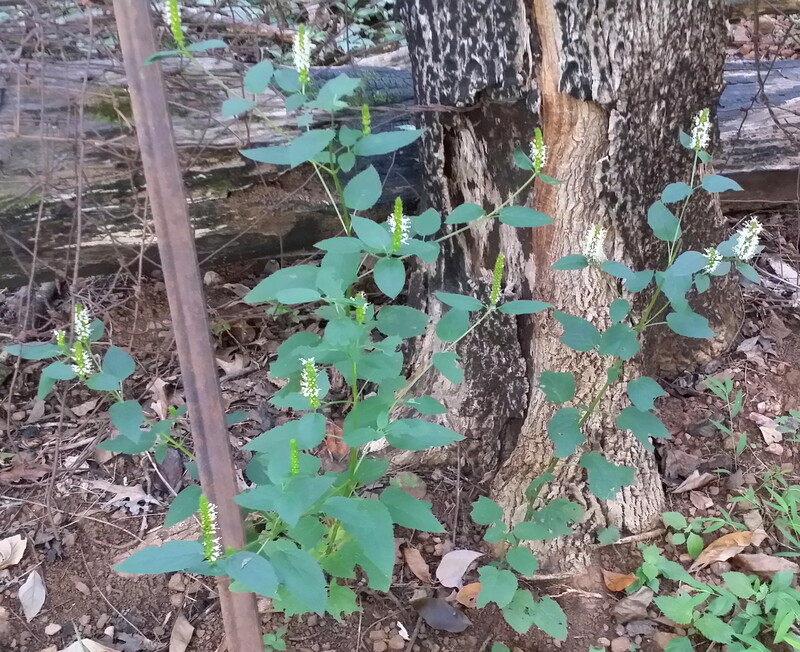 The main stems are tall and slender, with only a few branches. 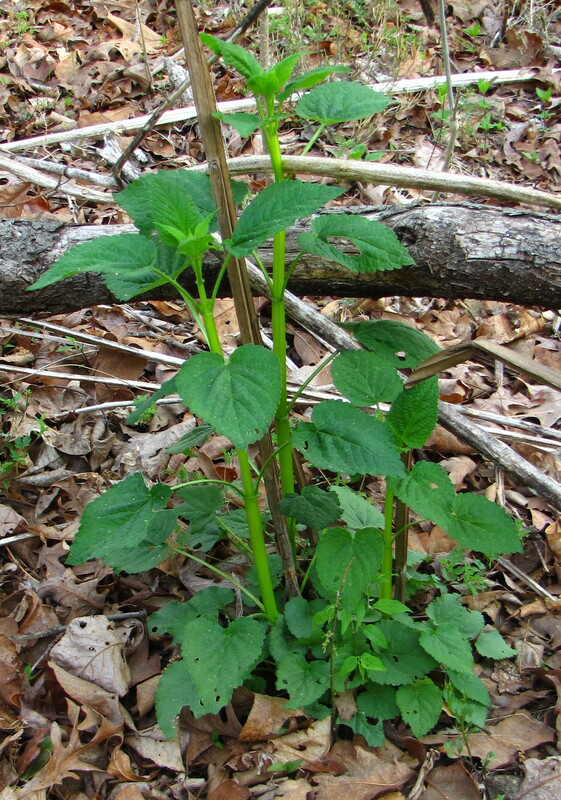 In North Carolina, Yellow Giant Hyssops begin new growth at the base of last year’s stem. 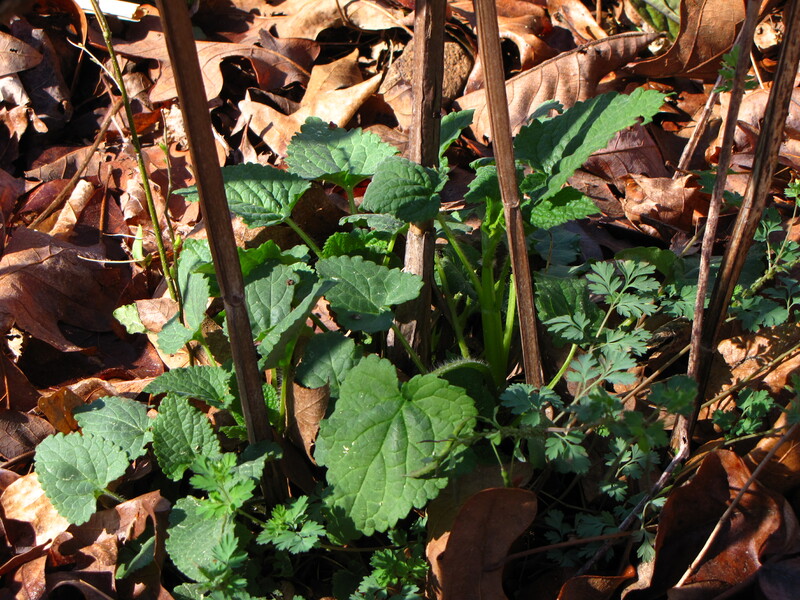 The photo below was taken in mid February by lightly brushing the leaf litter away from the base of the stem. By the first of April, growth of the new plant is well underway. 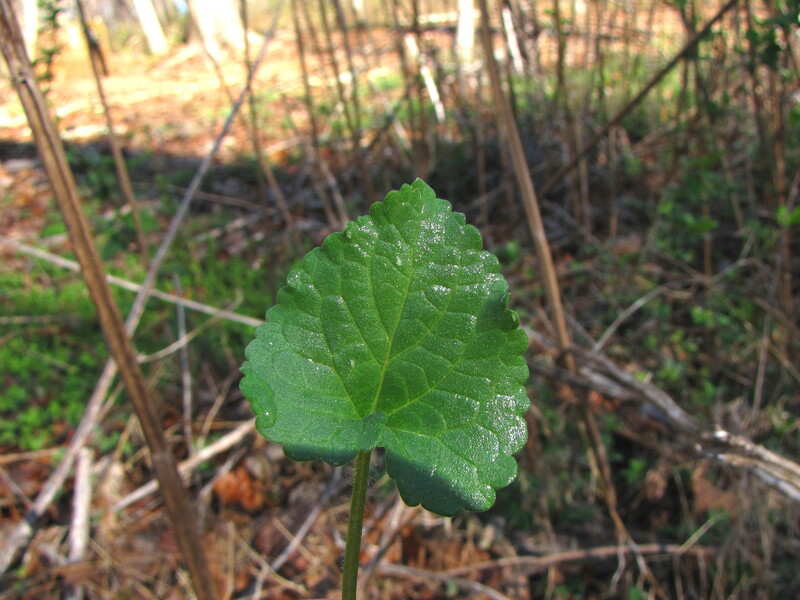 Most of the leaves seen in April are shorter and broader than the leaves seen in the mature plant. By mid April, plants are showing significant growth. 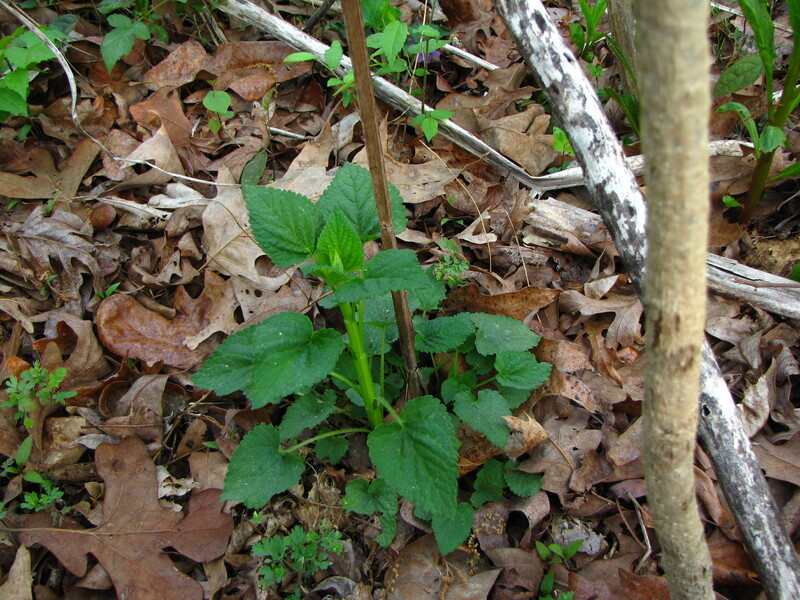 Notice in the first photograph below, there are three separate plants, each arising from the base of a dead stem. 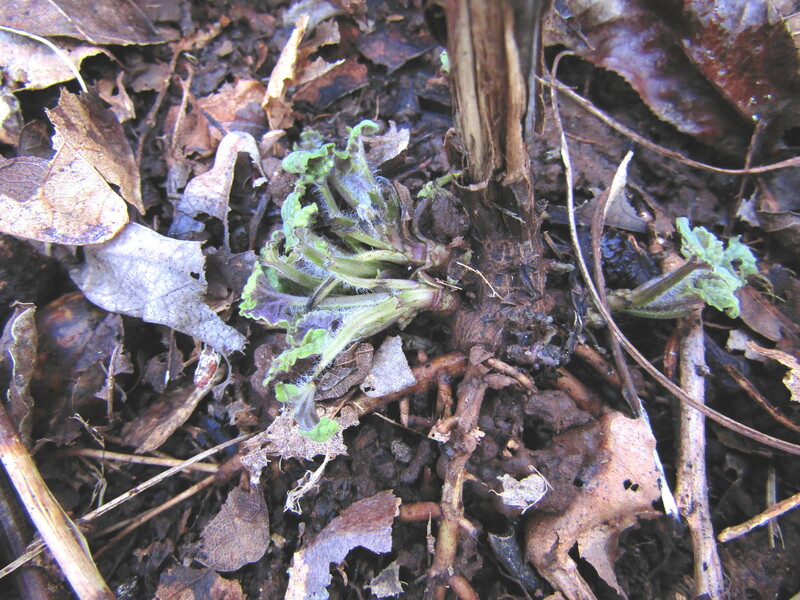 In the second photograph, there is one plant arising from one dead stem. In the spring, what was the terminal flower spike is now dried seed capsules. By late April, most of the seeds have been dispersed and the capsules are empty. In the large clusters of Yellow Giant Hyssops, there are also seedlings coming up in the early summer from spring seed germination. This population produced large numbers of seedlings scattered about the periphery. 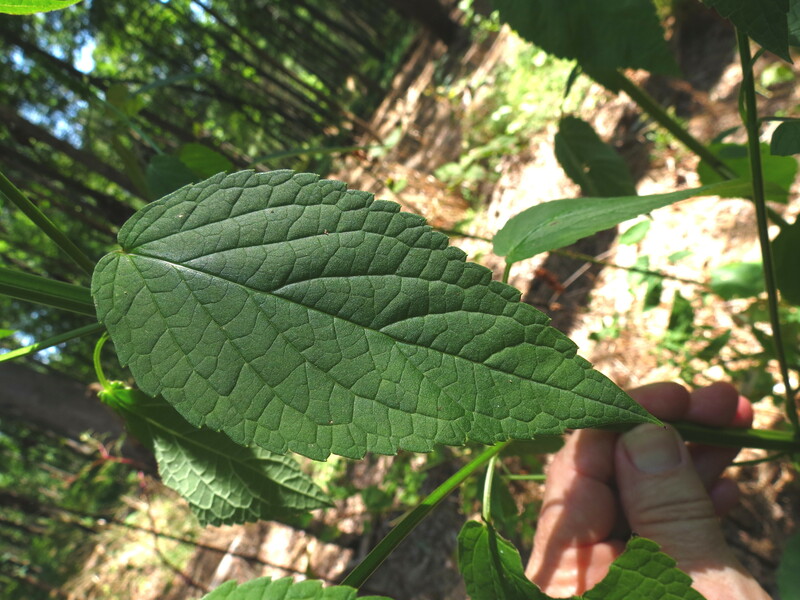 The leaves are softer and thinner than those from perennial plants. 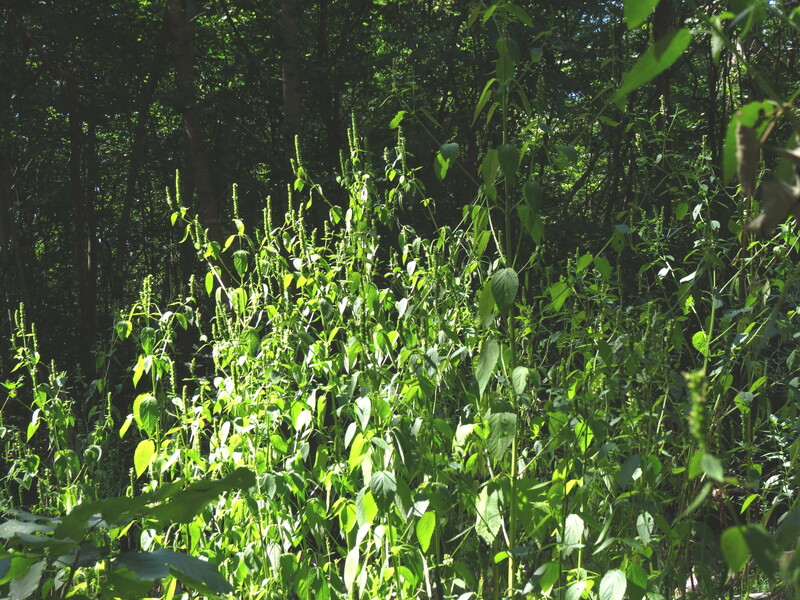 Some of the seedlings become quite tall by mid summer and go on to bloom when they reach three to four feet in height. The area where the seedlings above were growing was heavily browsed by deer. 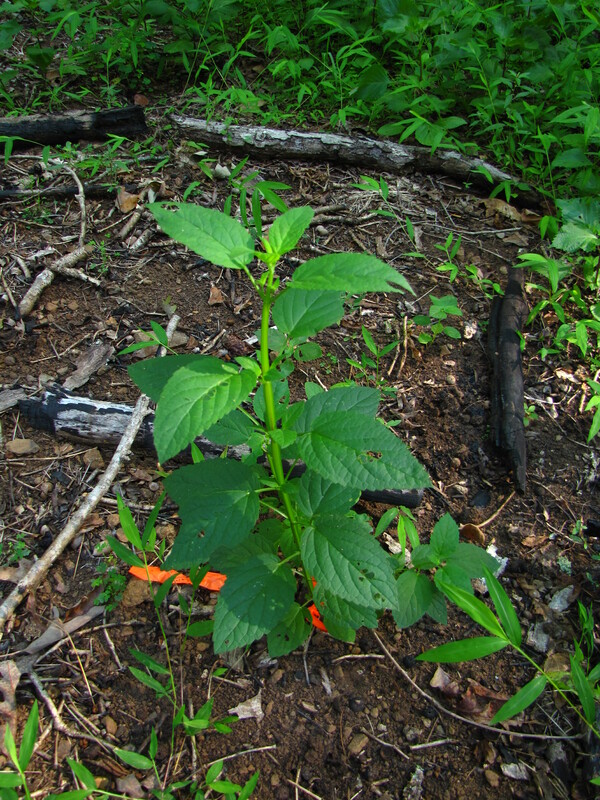 Below is a photo of Clammy Ground Cherries (Physalis heterophylla) showing the obvious deer predation. These Ground Cherries were scattered about with the seedling Yellow Giant Hyssops, which were completely untouched by the deer. Agastache sp. in general have a reputation for being shunned by deer. This is one of those rare times when field observations actually confirm the deer resistant reputation. The terminal spikes of the Yellow Giant are dense with flowers, but generally only a few bloom at a time, giving the look of a bare and uneven bloom. But in this population, illustrated below, there were a number of individuals that had showy blooms. The flowers are tubular with the lower lip being longer than the upper. In the closer view provided by the second photo, the flower structure and especially the long, extended stamens (the male reproductive organ) can be seen. 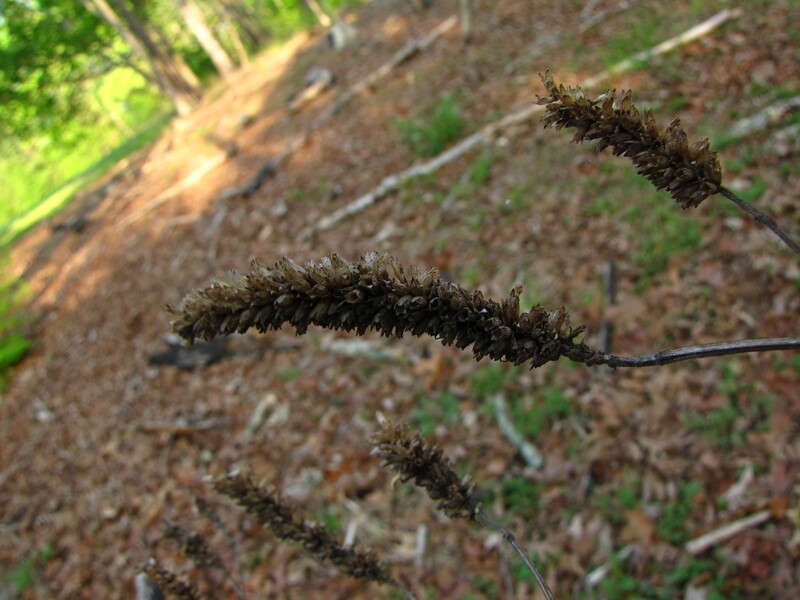 As mentioned in the introduction, Agastache nepetoides – Yellow Giant Hyssup – is a critically imperiled species in North Carolina. This means that it occurs in only five or fewer locations within the state, or there are very few remaining individuals, i.e. less than one thousand. Fortunately, there are at least two sites in the Central Piedmont where small populations are being protected and managed, with the hope of eventually expanding the number of individuals and populations. 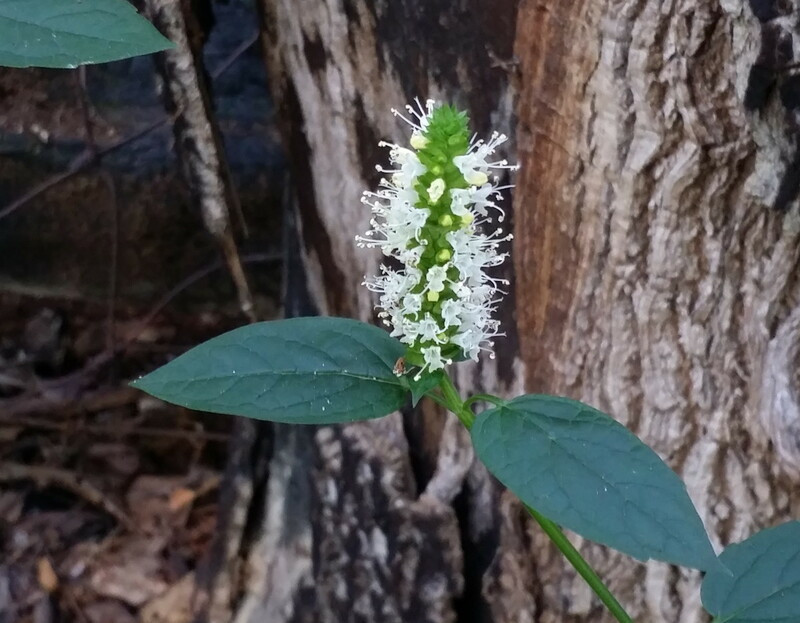 This entry was posted in Uncategorized and tagged Agastache nepetoides, Clammy Ground Cherry, deer resistant plants, N.C. Natural Heritage Program, Phylalis heterophylla, woodland over mafic rock, Yellow Giant Hyssop. Bookmark the permalink.